MOSCOW (RFE/RL) -- A day of mourning is being observed today for the 39 victims of the Moscow metro attacks. The head of Russia's national security agency says insurgents linked to the North Caucasus region are suspected of carrying out the two bombings. 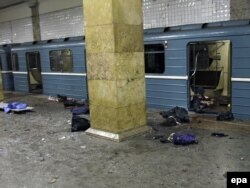 Emergency officials say two female suicide bombers blew themselves up on trains as they pulled into the Lubyanka and the Park Kultury stations about 30 minutes apart, during the morning rush hour on March 29. In addition to the 39 dead, some 64 others were injured. The two suicide bombers are not included in the general death toll. 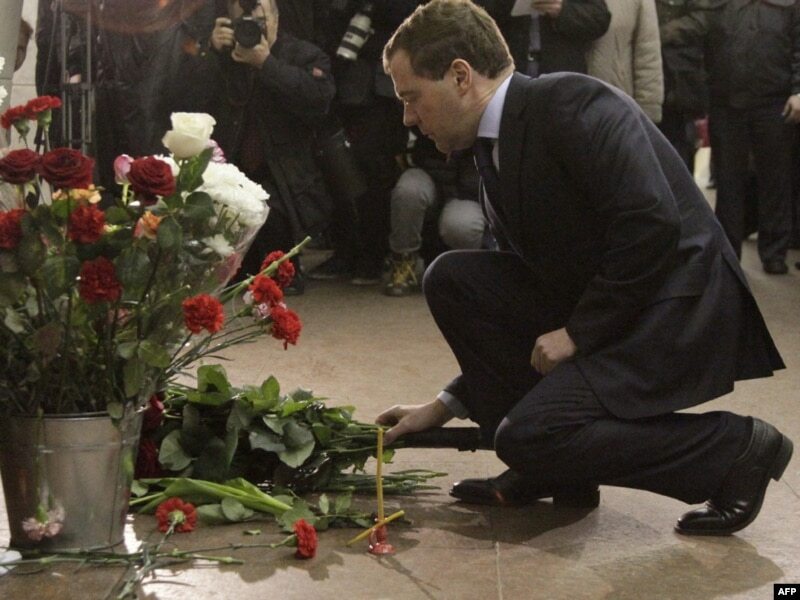 Russian President Dmitry Medvedev lays flowers in memory of the victims at the Lubyanka metro station. Aleksandr Bortnikov, head of the Federal Security Service (FSB), said during a televised meeting with Russian President Dmitry Medvedev that the assessment of a North Caucasus connection was based on fragments of the suicide bombers' bodies. "Our preliminary theory is that these terrorist attacks were carried out by terror groups linked to the North Caucasus region," he said. "We consider this the main theory." Medvedev ordered security to be stepped up on transport across the country and vowed to continue the fight against terrorism "to the end." "We're going to stay the course on suppressing terror in our country," he said. "We will continue operations against terrorists without hesitation, and until the very end." 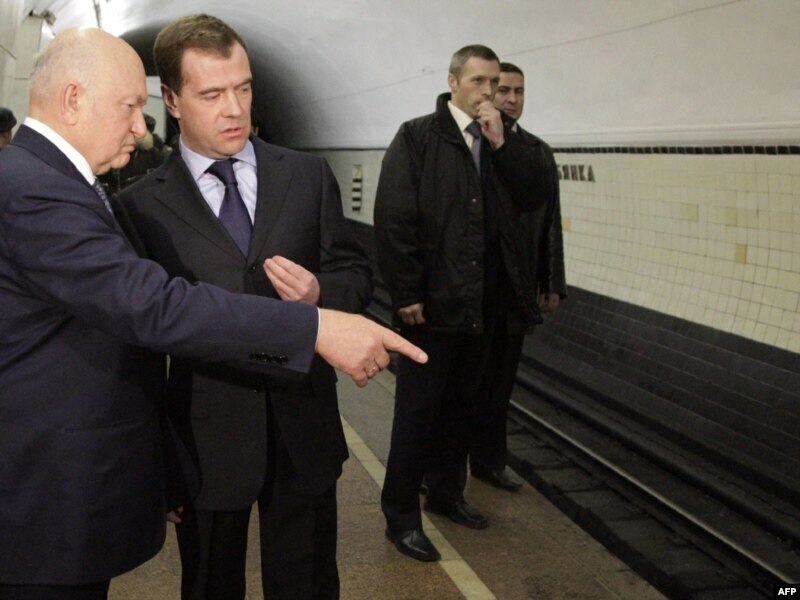 Joined by his wife, Svetlana, and Moscow Mayor Yury Luzhkov, Medvedev placed a bouquet of red roses with a black ribbon on the platform at the Lubyanka metro station where one of the blasts took place. Prime Minister Vladimir Putin said the "terrorists" behind the March 29 attacks will be found and "destroyed." WATCH: RFE/RL Russian Service correspondent Irina Lagunina talks about official Russian reactions to major terrorist attacks in the past. Emergency officials say more than 20 people were killed by the blast at the Lubyanka station shortly before 8 a.m. Those victims included people on the incoming train as well as on the platform. The headquarters of the FSB is located just above the station. Pictures from surveillance cameras broadcast on television showed bodies lying on the station's platform, while witnesses spoke of panic. "At the time of the blast I was transferring from Kuznetsky Most metro station to Lubyanka station," one man told RFE/RL's Russian Service. "I was going up the escalator when I heard a bang. It affected the door near the passage way, and a cloud of dust from the top covered the escalator, and people started running on the escalator, some were falling, scrambling. "I also started running and exited at Lubyanka Square. There was an enormous amount of equipment, fire engines, police. Rescuers with stretchers were running out of the metro." 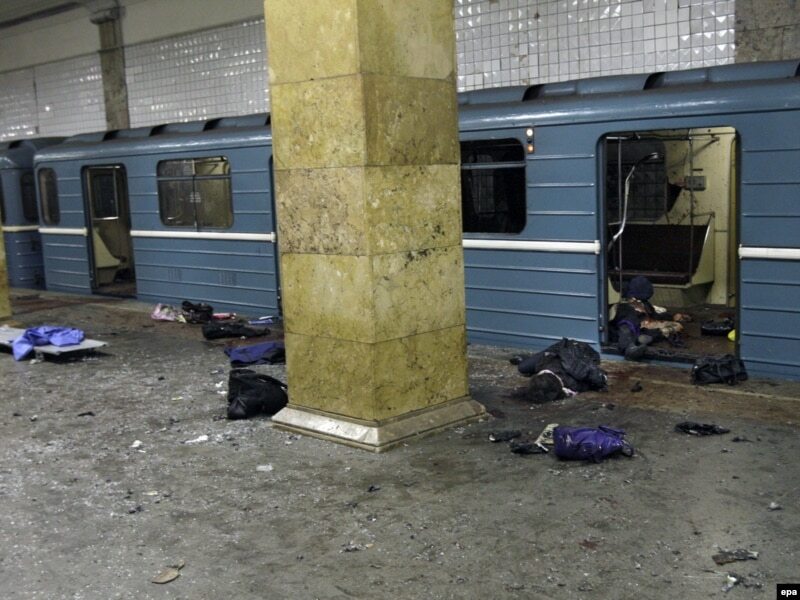 About 30 minutes later, the second blast went off, killing at least 14 more people at the Park Kultury metro station. RFE/RL's Russian Service reports that ambulances and firefighters had difficulty making their way to the sites of the explosions because of morning traffic jams. Duma deputy Viktor Ilyukhin -- the former head of the Duma's Security Committee -- told RFE/RL that he suspects the blasts were retaliation for the recent reported killings of militant leaders in the North Caucasus. "I think there is a direct link between the explosions in Moscow and events in the North Caucasus, for several reasons," he said. "The FSB, together with Interior Ministry forces, have carried out a series of successful operations in the North Caucasus recently, during which several top [militant] leaders have been killed. "I think that today those bandits have taken revenge on us for the operations that have killed those fighters in the North Caucasus." Firemen remove victims from Lubyanka metro station. Two leaders within the North Caucasus insurgency have been killed since the beginning of March. Russian authorities and insurgents have both confirmed the killing of Anzor Astemirov -- also known as Amir Seyfullakh -- on March 24 in Nalchik, the capital of Kabardino-Balkaria. Astemirov was the third-ranking figure within the insurgency leadership after Doku Umarov and Amir Magas. It also has been confirmed by Russian authorities and insurgent websites that security forces in Ingushetia killed Said Buryatsky in a gun battle on March 7. Buryatsky, a Buryatia-born ideologist of jihad, had last year revived the Riyadus-Salikhiin suicide battalion, which was created by renegade field commander Shamil Basayev. Members of that battalion have carried out several major car bomb attacks in Ingushetia and Daghestan during the past 12 months. Chechnya itself has seen a rise in violence in recent months as pro-Kremlin local authorities seek to clamp down on an uprising by militant Islamists. The international community has condemned the attacks. An injured man makes a phone call outside the Park Kultury metro station. In a statement, U.S. President Barack Obama said, "The American people stand united with the people of Russia in opposition to violent extremism and heinous terrorist attacks." European Commission President Jose Manuel Barroso delivered a similar message, saying in a statement that "the European Union stands resolutely together with the Russian authorities in [their] efforts to counter terrorism in all its forms." NATO Secretary-General Anders Fogh Rasmussen pledged the alliance's commitment to cooperating with Russia in the fight against international terrorism, saying there "can be no justification for these kinds of attacks on innocent civilians." Citing an improved security situation, Russia last year declared an end to a "counterterrorism" operation in Chechnya that has been going on for the past decade. But confidence in that declaration has been shaken by the recent spike in violence. Meanwhile, increased violence in Russia's nearby majority-Muslim regions of Ingushetia and Daghestan also has raised concerns that unrest could spread. No group has yet claimed responsibility for the blasts. The website kavkazcenter.com, which is often used by Chechen separatists to post announcements, issued an article suggesting that the Russian security services were behind the blasts. The unsigned article argues that opposition to Putin is growing in Russian society, and that the regime is prepared to go to great lengths to hang on to power. "Today, it is more and more evident that a moment of truth has come to the Russian society," the article said, adding that "anonymous terrorism" is one of the hallmarks of the Putin regime. Vladimir Pribylovsky, an analyst at Moscow's Panorama political research group, warned RFE/RL against taking claims of responsibility at face value. "We need to wait and see if anyone claims responsibility. But that won't prove anything," Pribylovsky said. "A claim of responsibility can be made by those who really are behind the explosion or those who're just interested in raising their profile." Moscow Mayor Yuri Luzhkov (left) and President Dmitry Medvedev inspect the site of the blast at the Lubyanka station. The seemingly coordinated metro blasts were the deadliest in Russia outside of the North Caucasus region since a double attack on two domestic Russian passenger planes in August 2004 that killed 72 people. Both of those planes had flown out of Moscow's Domodedovo International Airport. The last confirmed terrorist attack against a Russian train was on November 27, when an explosion derailed the "Nevsky Express" -- a high-speed train traveling between Moscow and St. Petersburg -- with about 700 passengers on board. At least 26 people were killed and 100 injured when that train hurtled off the tracks near the town of Bologoye, about 320 kilometers from Moscow. The last time the capital, Moscow, was targeted by a confirmed terrorist attack was in August 2004, when a suicide bomber blew herself up outside the Rizhskaya metro station, killing 10 people. The most prominent terrorist attack in Moscow with confirmed involvement of North Caucasus insurgents was in October 2002, when Chechen militants -- both men and women -- seized several hundred hostages at a Moscow theater to demand an end to the war in Chechnya and the withdrawal of Russian troops. The siege ended three days later, when Russian special forces released a knockout gas and stormed the theater. At least 129 civilians and 42 militants were killed.